Launched in 1906, as a bulk freighter, the Daniel J. Morrell was an imposing sight, especially for the time. At a heavyweight 608 feet in length and weighing in well north of 7000 tons, the Morrell was designed to haul the largest loads on the Great Lakes. She served faithfully for over 60 years hauling cargoes like iron ore and other building materials. Sadly, in November of 1966, she met her fate while carrying only a small amount of ballast. On that fateful last run of the season, the Morrell was caught in a squall with winds that exceeded 70 miles per hour and waves in excess of 25 feet. 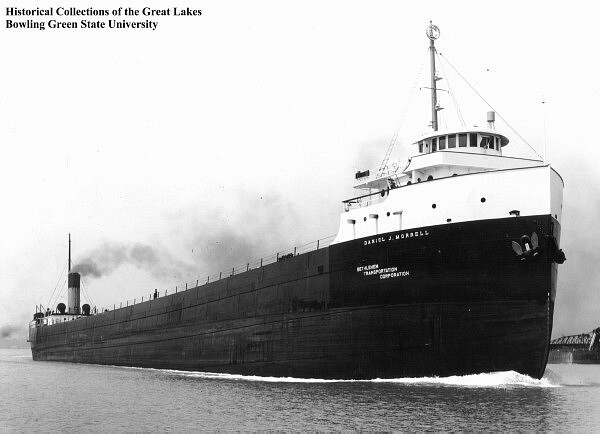 At 2am, the ship began to succumb to the storm, and a mere 15 minutes later, at 2:15am her crew began abandoning her and taking their chances in the 34 degree water of Lake Huron. Sadly, on that night the ship went down and so did 28 of her 29 crew members. She was not reported missing until over 10 hours later, past noon. At that time a Coast Guard helicopter was dispatched and ended up picking up the only survivor, a 26 year old watchman named Daniel Hale. When found, he was near death, in a frozen peacoat floating in a raft with three of his deceased crewmates. Today, the Daniel J. Morrell rests in 218 feet of water and is the perfect exploration opportunity for well practiced technical divers. We visit the Daniel J. Morrell from Harbor Beach.